Before you begin working with bugs, you must initially set up information's such as portal owner, personal profile, email notifications, ZSC keys and so on. Setup your personal profile information, email notifications and regenerate ZSC keys. Edit details about your Organization, Portal URL and Owner. Configure your project information, customize the tabs, and manage the project Email aliases to access Zoho Projects through your personal Email addresses in the Project Settings section. Integrate Zoho BugTracker with the other Zoho services in the Zoho Apps integration section. Integrate Zoho BugTracker with the third-party services like Bitbucket, GitHub, and Crashlytics in the Other Apps integration section. Import data from Jira, check your storage, take backup of your portal and view audit logs. 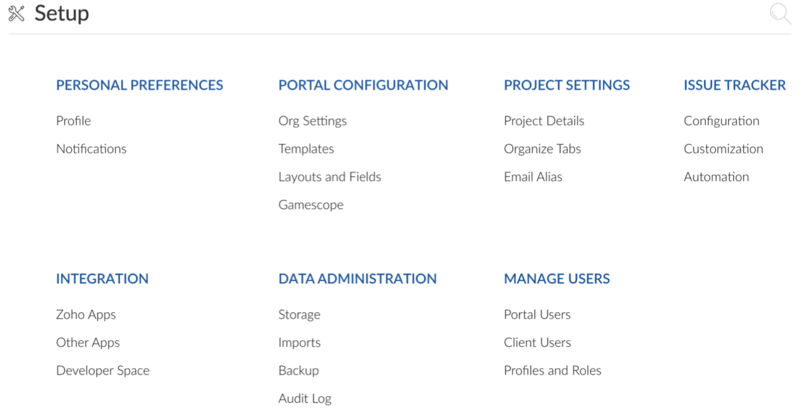 Manage portal and client users and set access privileges from this section.